SAN ANGELO, TEXAS-- A Lake View High School senior who was involved in a two-vehicle rollover Wednesday evening, died late Thursday evening. LIVE! had previously reached out to family members of Ezequiel "EZ" Reyes, 20, early Thursday afternoon, to learn more about who Ezequiel was and what he meant to the people in his life. Ezequiel was on his way to visit his biological mother at Shannon Medical Center when he was struck by a Mercury Mountaineer during a two-vehicle rollover crash Wednesday evening. Click here for our story. Late last night, family members confirmed the death of EZ through several Facebook posts. Ezequiel's family and friends hosted two prayer vigils last night, one at the Lake View high school flag pole and one at the intensive care unit in Shannon Medical Center. Both started at 7 p.m. (see our story here). In a quick interview prior to the death of EZ, EZ's cousin JD Rocha said that Ezequiel loved to play football and was a member of the Lake View High School football team. EZ was set to graduate next Friday. "Ezequiel had no fault in any of this,[he was] an innocent bystander in this situation," Rocha stated. Ezequiel's biological mother is Rocha's first cousin, and Rocha is the second cousin to Ezequiel. However Rocha told LIVE! that he treated EZ like a brother as they were inseparable. Ezequiel was raised by Rocha's mother, who give him a stable home while his own family went through some hard times. EZ has lived with Rocha's family since he started elementary school. 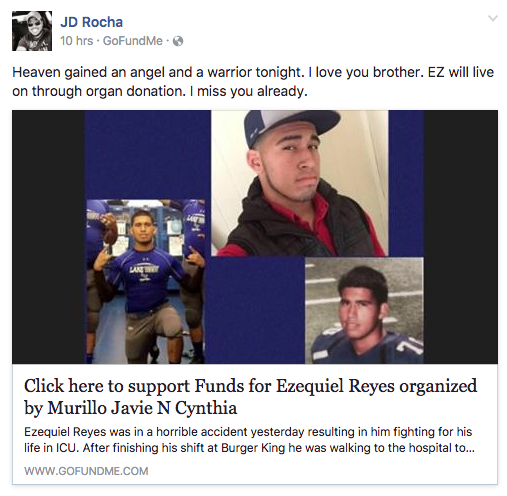 "As far as I know, Ezequiel is my little brother," Rocha said. "If you ask [him] he has two mothers, my mother and his mom." In the eyes of all his immediate family, Ezequiel is like a brother, son, or nephew to them. Ezequiel looked up to his older brother as he wanted to join the military just like Rocha, who is now an Army Veteran. Rocha told LIVE! that he had received a text message from Ezequiel before the accident, where he said that he wanted to go to school and study criminal justice so he could become a police officer. "I believe everyday is a gift and a blessing, and [Ezequiel] mimics me in this way," Rocha added. "[He] lived every day to the fullest." For the community members in the Concho Valley, Rocha gave his thanks for all of their support over the last few days. "From the bottom of our hearts, thank you so much for the support. I didn't realize Ezequiel had touched so many peoples [hearts]. We are just blessed to have [had] him be part of our family." In a press release sent out early this morning, the SAPD further confirmed the death of Ezequiel Reyes, "a preliminary time of death for Reyes was pronounced at 7:50 p.m. Thursday, May 18, 2017 by hospital staff. Official cause and time of death is pending by a Justice of the Peace ... The Department is deeply saddened by this tragedy." Before the death of EZ, the Reyes family had begun coordinating a flag football game to raise money for Ezequiel's hospital bills. The flag football game will begin at 1:30 p.m. on Saturday, at Lake View High School. For anyone who would like to help the Reyes family, and can not attend the flag football game, a gofundme page has been created to help support Ezequiel's medical expenses. Such as sad loss of life for this young man. Now, the question is, will the driver who caused the entire situation be held accountable?